Have you ever walked across a bed of hot coals? I’ve done a firewalk three times. And every time I learned something new. No, I didn’t learn that fire walks burn your feet. I learned about myself. A firewalk is a symbol of anything in your life that feels challenging and scary or a situation that causes you to wonder what will happen if you move forward. If you step into that situation, you worry that you’ll get hurt or “burned.” A burn could mean getting rejected, being judged or failing, for instance. A firewalk is also a metaphor for your life. Let me explain. Before walking on the bed of hot coals you spend time preparing yourself. You raised your energy. You create a power move you will do before you put the first foot on the coals. And you visualized a safe walk. You affirm over and over again in work, action, and mental imagery that this is not an act of stupidity. You and convinced yourself that the firewalk is safe and will help you realize you can do just about anything if you put your mind to it. You turn around and run. You go before you are ready, basically plowing forward without much consciousness about what you are doing. You walk intentionally and consciously across. I tend to be the plow-forward type of person. Many people do a firewalk in this way. When my turn came, a man stood at the beginning of the firewalk to check if I was ready. If he thought I was, he’d tell me to walk. I stepped right up, eager to get going. But, despite the fact that I’d practiced my power move so many times previously, I totally forgot to do it. I supposed I wasn’t totally unconscious because I knew I wasn’t saying what I’d planned. My fist was in the air but different words were coming out of my mouth. No planned power move. No telling myself, “I got this. Yes,” and walking deliberately, consciously, intentionally across those coals. Nope. Totally unconscious. I plowed forward before I was ready. I did not remember where to look, what to say with each step, or even to stop at the end. I don’t even know I’d reached the end. However, two people grabbed my arms, told me to stop, sprayed my feet with water, and made sure I wiped any stray coals off my feet. A firewalk is about facing your fears and taking control of your mind. So how is the firewalk a metaphor for your life…or, in this case, my life? In general a firewalk is about facing your fears and taking control of your mind—convincing your yourself you can do anything you set your mind to doing. That also means moving consciously through life. 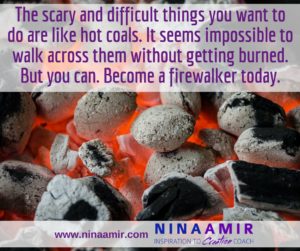 Here’s what my most recent (I’ve done two previously) firewalk taught me: Quite often when I face something scary, difficult or that I don’t want to do, I plow through it unconsciously and without deliberate action before I am certain I am ready. But I go. I do it. And guess what? I don’t get hurt (at least not much). After this firewalk, I had a tiny little place on one toe with a little pink place. It was gone two days later. The lesson? I can move forward before I’m ready, and any little resulting “burn” doesn’t cause a problem and disappears fast. Of course, I also learned this: I might want to take a deep breath and become present before plunging across the coals. That would allow me to move forward when I’m ready and able to do so consciously and intentionally. But when I don’t or can’t, I should still move forward. I still can make progress without negative ramifications. 1. A lot of things that you think are impossible are, in fact, possible. 2. You can convince your mind of almost anything—and the ability to do so is important if you want to move through (or over) your fears. 3. The things you’re afraid of are not real. They are false evidence (provided by you mind) appearing real. 5. Move forward with intention. 7. You can take action even when you aren’t ready. 8. When you act with intention and consciousness, it’s possible to have better results or a more fulfilling experience. If you walk across the coals once, you can do it again. Where in your life do you have a hot bed of coals across which you need to walk? What feels scary or challenging even though you’d like to take action on it? Time to walk across the hot coals…Take action! You are ready…Go! • Control your mind or thoughts. • Celebrate your successful action. And remember: If you walk across the coals—the real ones or the metaphorical ones—in your life—once, you can do it again. If you are interested in learning more about mastering your physiology and psychology to help you move courageously, consciously and deliberately toward your goals and dreams, apply for a free one-hour high-performance strategy session. (Click here to download the application.) Fill it out, and then attach it to an email and send it to Nina@Ninaamir.com. When you email, tell me you watched the fire-walker video in this post (or on Youtube), and I’ll give you the free strategy session, PLUS, if you sign up for my 12-week Certified High Performance coaching program, I also will give you a bonus session (value $300) and a ticket to Brendon Burchard’s High Performance Academy (value $997) this March in San Diego. Enter the New Year by walking across whatever coals have stopped you in the past from achieving your potential. You’re ready. You can do it. Yes!